Mobile payment apps might be China's latest greatest invention among young smartphone-savvy urbanites, but for many older generations of Chinese, such newfangled technology only serves to make their lives more confusing. A 66-year-old resident surnamed Wang from Taiyuan, North China's Shanxi Province, shared with the Global Times her horrible experience trying to use WeChat Pay for the first time for a taxi ride. The senior woman had mistyped the 13.80 yuan ($2.17) fare as 1,380 yuan, forgetting to put in the decimal point. The taxi driver did not inform her of her mistake, and Wang was not alerted to it until one of her adult children checked her account, hours later. Wang then tried to contact WeChat's customer service hotline to track down the taxi driver, only to be told that WeChat does not provide account information about other users due to privacy issues. The expensive mistake, which has not been rectified, served to remind Wang that modern technology and "unreliable services" like mobile payment apps have no place in her life. For many young Chinese adults and even students, mobile phone apps have become a point of pride in the nation's technological advancement. Services such as WeChat Pay and Alipay have indelibly made daily life easier and faster. But among the older generations of Chinese citizens, who grew up in the pre-digital era, where paper currency, paper ticketing and face-to-face service were a way of life, many feel sidelined by the rapid technological advancements. "We are at just the right age to enjoy the conveniences brought by new technology, such as door-to-door delivery services. But I cannot handle all the complicated operations and features of online shopping," a 75-year-old resident of Beijing surnamed Bai told the Global Times. "For people who grew up in the 1960s, we have made a lifelong contribution to our society, but now we feel abandoned by it. We look like foolish old guys who are always baffled by new gadgets," Bai added, staring enviously at the taxis passing her by. She knows that they are all reserved for young tech-savvy passengers wielding taxi-hailing apps and she has a slim chance of catching one from the side of the road. Bai's statement begs the question many other Chinese seniors as well as tech companies and NGOs are now asking: Should a person who does not have a strong consumptive ability be eliminated by modern society? In light of this concern, some NGOs in China have become an important force in calling for "equal rights and opportunities for everyone to benefit from mobile payments." 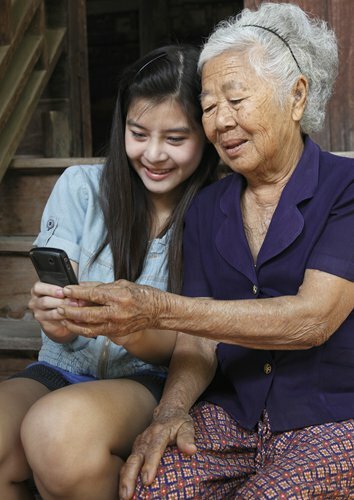 The SEE YOUNG Social Work Service Center, which aims to get China's elderly onto mobile services, is on a mission to help older generations harness technology quicker and safer. 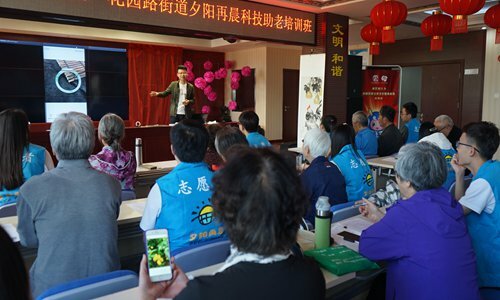 A small group of tech-savvy young Chinese volunteers at SEE YOUNG regularly provide free computer training sessions and workshops for seniors about using mobile payment tools. The volunteer students spend their spare time scattering into 200 communities throughout the country to help "drag" the older generation into the fast lane of computers, smartphones and digital devices. In their wide spectrum of interactive sessions and one-on-one training courses given by the young mentors, the seniors are asked to use their own phones and devices. "The elderly are particularly dependent on student volunteers. During summer breaks, they keep asking us when we will come back," SEE YOUNG coordinator Shi Qianqian told the Global Times. "That's why we are opening a new online channel that allows us to give instant responses to their pop-up questions." Before joining the group, a senior surnamed Huang performed poorly at the manual tasks mobile phones require of users. But her eyes quickly widened and sparkled after a student introduced her to the "grabbing red envelopes" feature on Alipay. "We study quickly, but forget more quickly," the 65-year-old said. "What's more of a headache is remembering passwords. That's surely daunting for every old lady like me," Huang told the Global Times, adding that she hopes that more age-friendly digital products and services will soon emerge in the Chinese tech market. For example, payment apps designed for aging hands and eyes. "The font size and design of mobile payment apps should consider us more, because we usually have to wear presbyopic glasses when using them. It's really embarrassing to make others wait behind me at the checkout counter because I can't see my small screen and all its complex menus," said Huang. "It's too hard to get rid of years of consumer habits and ideas. But if you don't learn new stuff, you won't survive in such a modern world," she added. Before going back to her personal training session, Huang laughed a little brighter. "Now I'm learning to overcome my fear of digital technology. I love to practice more and more because it is really a trend." While getting around in China with just a phone is a new lifestyle being enjoyed and taken well advantage of by young Chinese, how will China's 241 million seniors adapt to the nation's rapid digital disruption? Chinese seniors are expected to exceed 255 million by 2020, which some local e-commerce giants see as a potential "silver economy," but only if they can successfully integrate the elderly with their latest technological advancements. Hema Fresh, a new retail online chain, is one such business closely following China's silver economy. The company's CEO, Hou Yi, told CCTV that how to serve China's elderly and bring them the convenience of internet consumption is one of their biggest questions as China enters an aging society. "The new way of grocery shopping (e-commerce) has increasingly attracted people aged over 50, now accounting for 20 percent of our users. More and more elderly now enjoy having their goods delivered to their doorstep, so we will launch even more new services aimed at this age group," Hou said. Hou is confident that more tech companies will embrace China's growing silver business market by creating a convenient consumption environment and a better mobile payment experience for seniors. Liu Xiangyun, a 59-year-old retired female professor, told the Global Times that online grocery shopping has saved her vast amounts of time and energy. "Fresh stuff for the whole week can be heavy to carry, but using my phone I can complete all my shopping in only 10 minutes," Liu said. In January, Alibaba's popular C2C e-commerce site, Taobao, officially launched a new channel to win over the senior generation of online retail shoppers. Prior to the channel's launch, Alibaba posted an ad announcing it would recruit "senior user researchers," preferably those with prior e-retail experience. The new service enables senior users to link accounts with their spouses or adult children, which allows them to share purchases in private chat groups and make payments for each other through the "pay-for-me" option. Senior parents with accounts linked to their adult children can now pay their bills simply by clicking on the phones even if their own online payment accounts are not associated with any credit cards. "The service turns their adult children into a private hotline for elderly parents," Liu told the Global Times. Liu's son, an engineer working in Beijing, told the Global Times that shopping online for elderly parents has helped improve his relationship with his mother, as it allows them to chat more often online and share their purchases and ideas. PR staff at Alipay told the Global Times that their new aging-friendly app also helps prevent and alleviate the sense of isolation and loneliness that retirees often feel. "The good news is that most of the elderly in our research seem enthusiastic about learning the new tech and reaping its benefits. It has even become a kind of social capital for veteran users," she said.